Stormwater Runoff – Watt Commercial Sweeping, Inc. It may seem that keeping a clean lot is just done to “pretty” your business and make it look good, but that is not the case. It is essential to have your business regularly cleaned in order to help your business to not negatively and harmfully effect the drinking water sources surrounding your business. The AJC, The Atlanta Journal-Constitution, just broke open a case of extreme EPA violations. If you don’t understand yet the importance of having your business regularly swept, read the AJC story that reports of maggots, blood and large chicken storm water run-off! You may just realize that sweeping your lot regularly should not be seen as optional and you should without any doubt work in a lot sweeping program from Watt Commercial Sweeping, Inc. into your budget! 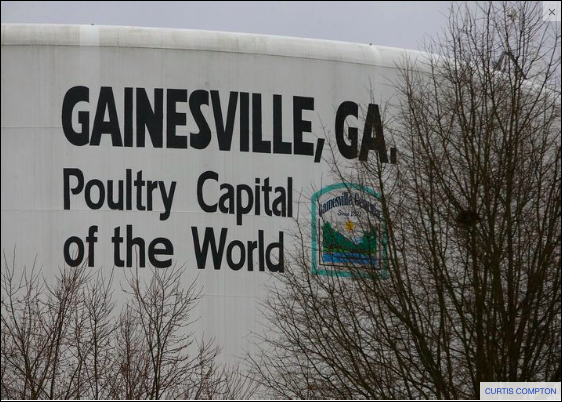 A water tank touts Gainesville as the poultry capital of the world. Nearby Lake Lanier provides drinking water to metro Atlanta. Two of the state’s largest chicken processors are located along a creek that feeds into the lake.